This is a compression or squeezing of the nerve opening between the vertebrae. This is often called a pinched nerve. 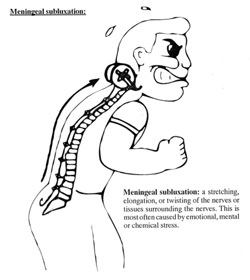 98% of the Chiropractic profession deals with this only. 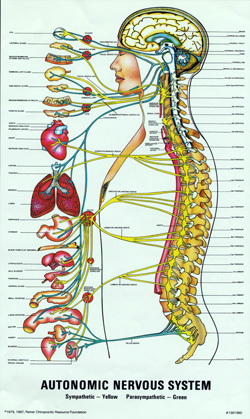 This is a stretching, elongation, or twisting of the spinal cord and associated nervous tissue. This is most often caused by emotional, mental, chemical and different physical stresses that the body could not adapt to or recover from. It is as if your spine were a fishing rod with the reel in your neck and the hook in your lower back. When stressed, our body goes into STRESS PHYSIOLOGY and the line gets reeled in. You then get thrown forward into a direction that the body cannot correct itself because there are no muscles pulling in the direction needed for correction. Now the only thing that the body can do is compensate to this position. Over time we compensate dozens to hundreds of times. BUT WE NEVER FULLY RECOVER! If you do not recover, then the memory of the distress or upset is retained in the cells of your nervous system. You react as though the upset is still happening in the present. You lose your ability to perceive life with clarity and flexibility. You never fully HEAL! As long as your brain can communicate with your body, your body functions properly. The messages go from the brain down the spinal cord and out the nerves to all of your tissues, organs, and cells. If something blocks the messages from getting through from your brain to your body cells, your body stops functioning properly. 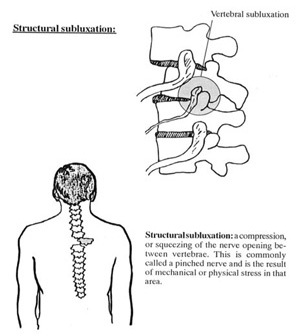 The structural and meningeal subluxations are the 2 main ways that this breakdown in communication occurs. Most people go to the doctor when the symptoms get to the point where they can longer handle it. You may be given a pill, potion or lotion that is designed to cover or mask your symptom. If this doesn’t bring relief, you may try stronger medication or be advised that surgery should be performed. The problem with this approach is that if you cover the symptom without correcting the cause, your body continues to malfunction, however you no longer have the warning sign that something is wrong. It is like removing the battery from the fire detector because the noise bothers you. Symptoms are body awareness. They are the way your body/mind lets you know that something is not working properly and that something needs to CHANGE! If you choose not to listen, your body/mind will scream louder and louder until you pay attention. Is it possible for it to FUNCTION properly again? We have a different story here in this office. We believe that things happen to us in life that throw us out of balance. These things can be physical, chemical, emotional, mental, and spiritual. When we get thrown out of balance, that’s when the aches, pains, symptoms, and diseases occur. If we can do something TOGETHER to bring your system back into balance then the wisdom within you is capable of healing you from anything. This is a HEALING procedure not a treatment procedure! We believe and have seen thousands of people HEAL from all sorts of aches, pains, ailments even diseases. That makes it possible for you too! The body/mind is smart. You can FUNCTION properly again. The work we do in this office maximizes the body’s fullest potential for healing itself! We are excited for you and the possibilities that lie ahead!